At a hearing Thursday afternoon, the court affirmed the City’s order to have The Kunkel Group, the developer, complete a long list of repairs in order to get the McCurdy Building up to code. The historic landmark, which was built during World War I, has continued to fall into disrepair. The awnings are torn, some windows are shattered and plywood covers some of the doors but not all of them. City officials say one set of doors isn’t completely secure which allows easy access to vagrants. The roofing has also deteriorated to the point where some of it will blow away if there is a strong wind. Officials say, on one occasion, some of the roofing hit the nearby Old National Bank Building during a storm. 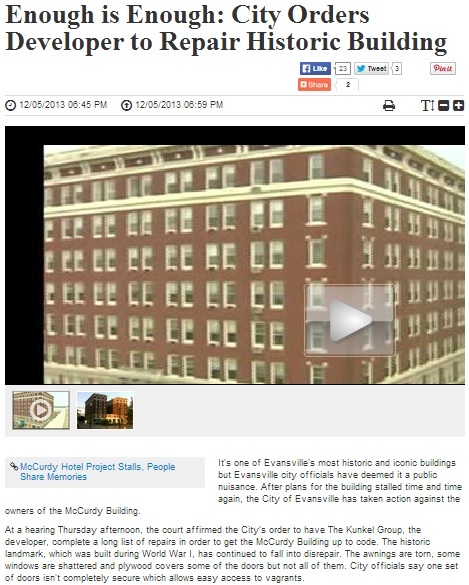 While the McCurdy Building owners have said that the city government’s actions were politically motivated, it cannot be denied that buildings that are in a state of disrepair pose a safety threat not only to the occupants, but also to those within a building’s vicinity, as well. The preservation of historic buildings is regulated by government standards and guidelines, which require that any replacement and treatment retain the historic materials and features of a building. However, preservation measures must also conform to present day health, safety, and energy-efficiency standards. The state of Indiana hosts many historic buildings not only in Evansville but in its other towns and cities as well. In restoring, preserving, and rehabilitating historic buildings, owners and managers need to rely on the expertise of professionals who can perform the right balancing act between retaining historical features and conforming to modern functionality standards. Reputable roofing companies in Northwest Indiana, like Rogers Roofing Inc., which have proven track records in installing and maintaining commercial roofing, are among the most qualified to work in such undertakings. The town of Schererville, in particular, has a long history that goes back to the time of covered wagon settlers. Several historic homes and building, therefore, exist in the place, and noted Schererville, IN roofing companies like Rogers Roofing Inc., may be relied on to perform the right roofing installation and maintenance for these structures.